As we enter 2019—CAPC’s 20th anniversary year—I’m taking the opportunity to celebrate how very far we’ve come as a field, and to challenge everyone to double down on ensuring access to high quality palliative care, everywhere that people need it. Twenty years ago, in 1999, the Robert Wood Johnson Foundation (RWJF) approached me and my colleague Christine Cassel, and asked us to lead a National Program Office devoted to scaling access to palliative care in hospitals. With the strategic guidance of our program officer at RWJF, Rosemary Gibson, and an intrepid band of staff and consultants, we launched CAPC, with a sole focus of increasing access to palliative care teams in US hospitals. Using tried-and-true business principles of developing a clear business case for palliative care and investing in audience-specific social marketing to speak to key decision makers in language that is meaningful to them, we contributed to a more than tripling of the number of hospital palliative care teams in the US between 2000 and 2015. Not only have we seen an increase in the number of these teams, but more patients are benefitting. 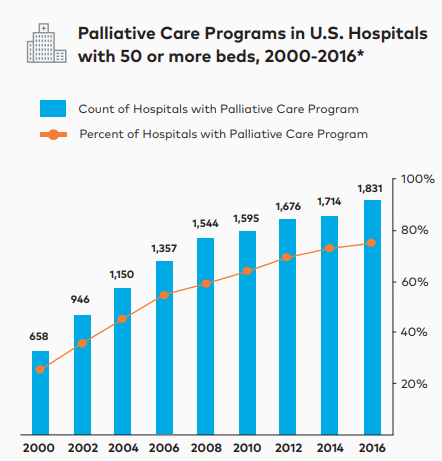 The graphic below shows the year over year increase in the number of hospitalized patients receiving help from a palliative care team in terms of penetration—that is, percent of hospitalized patients receiving palliative care. First, we built an online training curriculum to help our physician, nursing, social work, and other colleagues develop the essential skills in which most of us did not get trained originally—skills like how to disclose serious medical news, how to help patients and families determine what is most important to them in the context of their illness, and how to safely and effectively manage distressing symptoms like pain and difficulty breathing. We also built courses on how to reduce sources of suffering for a number of common chronic illnesses, including dementia, COPD, and heart failure. Illustration from CAPC’s new Dementia Care curriculum. Since launching the first online courses in 2015, more than 235,000 courses have been completed by over 33,000 individual clinicians. And, almost 10,000 users have obtained CAPC designation status in pain management, symptom management, and communication skills. Far exceeding our best hopes, we are gratified that many more clinicians are now caring for their patients with the knowledge and skills needed to do their best job. 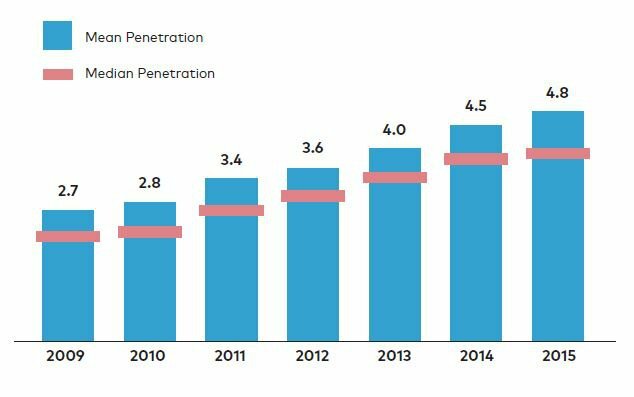 Second, we also grew from being solely and very generously funded by philanthropy—a combination of foundations and individual philanthropists—to a more diversified portfolio of support as a membership organization. Since launching membership in 2015, we are honored to have served over 1,600 organizational members, including health systems, hospitals, and many community organizations, such as hospices, home care agencies, group practices, and long-term care facilities. While private philanthropy continues to be vital to CAPC’s sustainability and growth, we have been able to diversify our operating budget through earned income from membership dues. Third, it is clear that access to palliative care is just as important at home and in other community settings as it is in the hospital. In recognition of the urgent need to scale access to this kind of care whenever and wherever a patient and family could benefit from it, we have built tools, training, and technical assistance to help build and sustain these services. In addition to member resources, these include an extensive community-focused curriculum for programs training with Palliative Care Leadership Centers (PCLC) and the very practical Palliative Care in the Home: A Guide to Program Design, both developed with guidance from leading palliative care programs from across the country. Early data from our Mapping Community Palliative Care project shows that more than 1,200 counties in the US now have access to at least one program delivering palliative care beyond the walls of a hospital. CAPC has identified 1,200+ counties in the United States that offer community palliative care. Great progress has been made since our field began. In twenty years, palliative care has gone from something no one had ever heard of, to a widespread service, a formal medical and nursing specialty, and a field with a strong research evidence base underscoring its ability to improve quality of care and quality of life, as well as to reduce preventable and costly ER visits and hospitalizations. In large part as a result of this growing body of evidence, organized medicine is taking notice—health insurance plans, medical educators, state regulators, regulatory and accrediting bodies, and policy makers are all investigating how they can contribute to improving access to high quality palliative care for Americans living with serious illness, and for their family and other caregivers. In twenty years, palliative care has gone from something no one had ever heard of to a widespread service. Palliative care has proven its value and more and more elements of organized medicine want to be part of it. 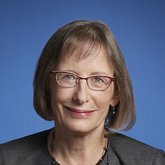 Being taken seriously as part of the solution to the difficulties facing the health care system in this country means that palliative care has reached a tipping point—the point at which access to palliative care moves beyond luck, towards a standard and reliable element of quality health care in the US. This is a window of opportunity to achieve our goal of Palliative Care Everywhere. To keep the momentum moving we have launched the Tipping Point Challenge, a competition for health care organizations. The goals of this year’s first Tipping Point Challenge are to: 1) increase the number of palliative care specialists maintaining the highest level of specialist palliative care skills, and 2) increase the number of other specialties and disciplines enhancing their skills in communication, pain management, and symptom management. 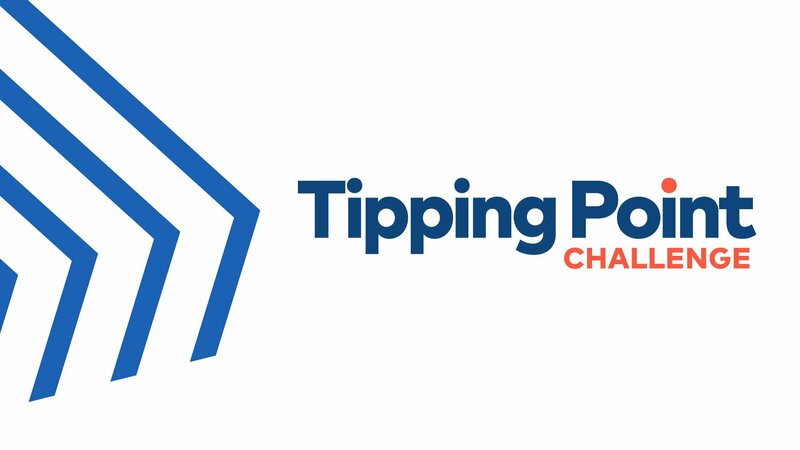 Stay tuned as we report on achievement of the goals of the Tipping Point Challenge. Thanks to all our friends and colleagues joining us in this important work—you are the reason for our celebration of twenty years of progress, and are fulfilling the promise of highest-quality care for all people living with a serious illness.